From left to right: Instructor Stephen Feldbauer, students Logan Shirey, Christopher Stewart, Kyle Bear, Andrew Bigley, Kurt Diehl and Nicholas Carrier, former student and currently a research technologist. Image courtesy Penn State. 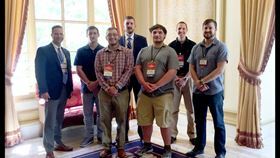 Six students from the Penn State DuBois general engineering program attended POWDERMET 2017, the international conference on powder metallurgy, this June. Their participation in the conference was due to a student grant from the National Science Foundation, a grant that the students qualified for due to the merit of their research. ‘The grants from the NSF and MPIF (Metal Powder Industries Federation) provided these students a unique opportunity to make the connection between academics and current issues that are important to the powder metal industry, while making many new contacts with the industry’s industrial and technical leaders,’ said Stephen Feldbauer, an instructor in engineering at Penn State DuBois. ‘I cannot state how much of an honor and privilege it was to receive this grant,’ said student Kurt Deihl. ‘I could have never gone to something like this on my own. The educational value for anyone attending this event, especially with me being a freshman, is absolutely incredible. I came out of the event with a much larger understanding on, not just the academic side, but industry as well. I learned so much about technologies and processes that I previously didn't know existed. This story is reprinted from material from Penn State, with editorial changes made by Materials Today. The views expressed in this article do not necessarily represent those of Elsevier. Penn State University in the US plans to offer residential and online master’s degrees in AM beginning in the autumn of 2017.